A map showing the range of the Permian Basin and the distribution of oil wells in the region. Bridget Scanlon. Hydraulic fracturing often brings up large volumes of water that need to be managed. 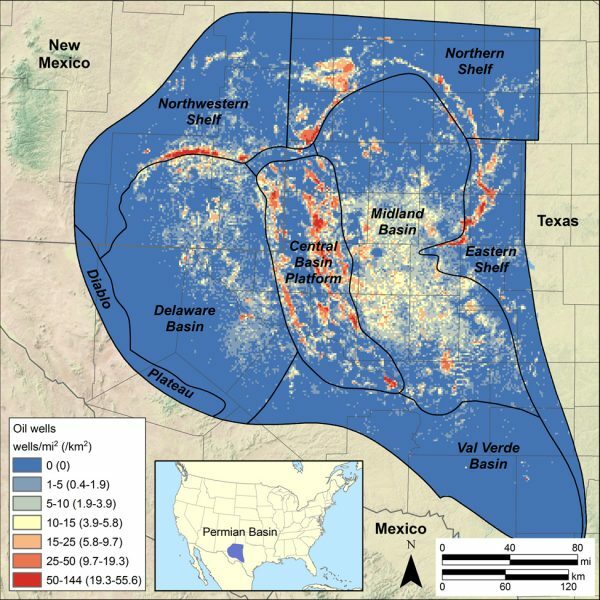 A study led by The University of Texas at Austin has found that in the Permian Basin, a large oil field in Texas and New Mexico, reusing water at other well sites is a viable way to deal with the water that could also reduce potential instances of induced seismicity. Scanlon co-authored the study with bureau researchers Robert Reedy, Frank Male and Mark Walsh. The bureau is a research unit of the UT Jackson School of Geosciences. Since the 1920s, the Permian Basin has been a very active area for conventional oil production, peaking in the 1970s and accounting for almost 20 percent of U.S. oil production. Hydraulic fracturing technology has revived production in that area by allowing companies to tap into immense oil reserves held in less permeable unconventional shale formations. The new technology is turning the conventional play into an unconventional play and has almost brought oil production up to the 1970s peak. The U.S. Geological Survey estimates that the Permian’s Wolfcamp Shale alone could hold 20 billion barrels of oil, the largest unconventional resource ever evaluated by the agency. The study analyzed 10 years’ worth of water data from 2005 to 2015. 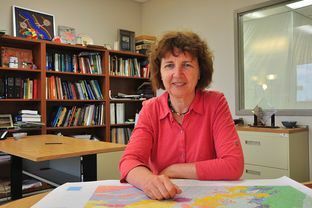 The researchers tracked how much water was produced and how it was managed from conventional and unconventional wells and compared those volumes with water use for hydraulic fracturing. 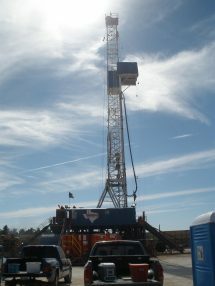 A hydraulic fracturing well site in the Permian Basin. U.S. Geological Survey. Upfront, unconventional wells use much more water than conventional wells. The average volume of water needed per well has increased by about 10 times during the past decade, according to the study, with a median value of 250,000 barrels or 10 million gallons of water used per well in the Midland Basin in 2015. But unconventional wells produce much less water than conventional wells do, averaging about three barrels of water per barrel of oil versus 13 barrels of water per barrel of oil from conventional wells. Marc Engle, the chief of a U.S. Geological Survey program on water use associated with energy production, said that the study provides a comprehensive, data-driven look into how water is managed in the rapidly changing Permian Basin. Although there is enough produced water for reuse, Scanlon said that infrastructure, questions about produced water ownership, and low cost of fresh or brackish groundwater may currently keep disposal practices as they are. But as unconventional operations in the Permian grow, reusing produced water may become more attractive. The study was funded by the Cynthia and George Mitchell Foundation, the University of Texas Energy Institute, the Tight Oil Resource Assessment consortium and the Jackson School of Geosciences.